Peninsula Energy Limited (ASX:PEN) announced that it has signed binding agreements to sell a portion of its uranium interests. 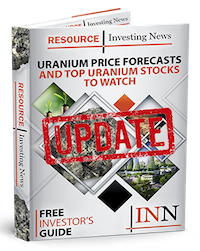 Peninsula Energy Limited (ASX:PEN) announced that it has signed binding agreements to sell a portion of its interests in existing long-term uranium concentrate sale and purchase agreements for US$19.0 million. Transaction accelerates the timing of net income from the balance of certain existing uranium concentrate sale and purchase agreements. Peninsula retains a strong contract book with up to 6.6 million pounds U3O8 remaining under contract at an average price of US$51-53 per pound U3O8. With a strong cash position and additional financial flexibility, the Company no longer has a need for its undrawn working capital loan facility. One of Peninsula’s defining strengths is our sales contract portfolio. Today we have greatly enhanced our current financial position by accelerating some of the income potential contained in that portfolio. This non-dilutive cash infusion should allow the Company to comfortably advance our production improvement initiatives at the Lance Projects. Click here to read the full Peninsula Energy Limited (ASX:PEN) press release.